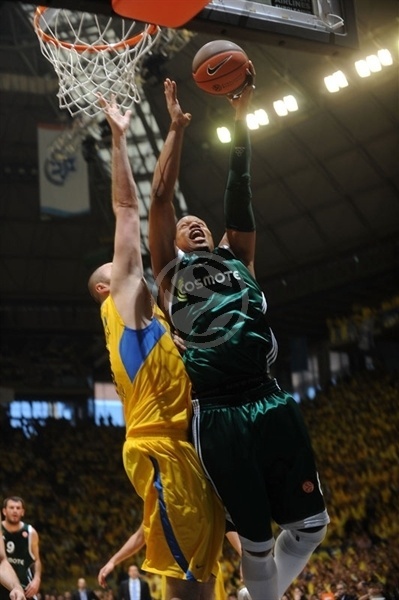 Maccabi had the ball first, but a dropped pass cleared the way for a Diamantidis layup to open the scoring. Ian Vougioukas doubled the lead before Schortsanitis found Guy Pnini open in the corner for a triple. The Greens’ frontline was sharp early as Antonis Fotsis and Vougioukas came through with consecutive blocked shots to deny Maccabi. Vougioukas added to his strong start with a basket, but a loose ball foul was his second and brought him to the bench just three-and-a-half minutes into the game. 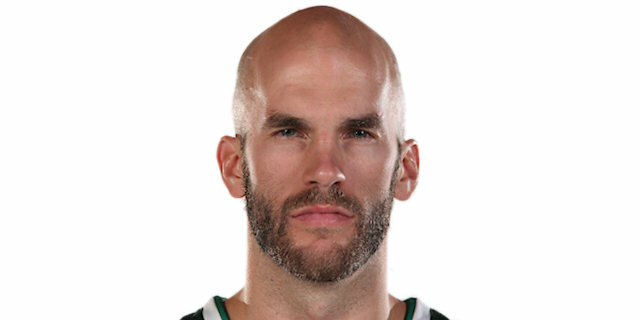 Eidson knotted the score at 6-6, but Nick Calathes quickly put Panathinaikos back ahead with a baseline drive. 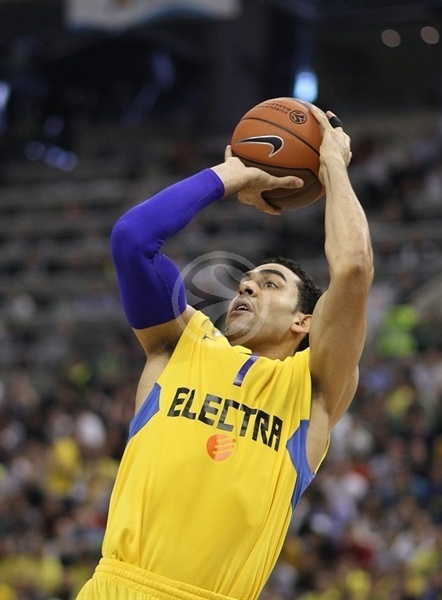 Sofo set up Pargo at the rim and though he was fouled, he evened the score from the line. Fotsis attacked the offensive glass for a follow-up basket and Schortsanitis’s second foul. Despite another block inside, this time from Vougioukas’s replacement Aleks Maric, Pnini got the ball for triple and then Blu gave Maccabi its first lead of the night from the line, 13-11. 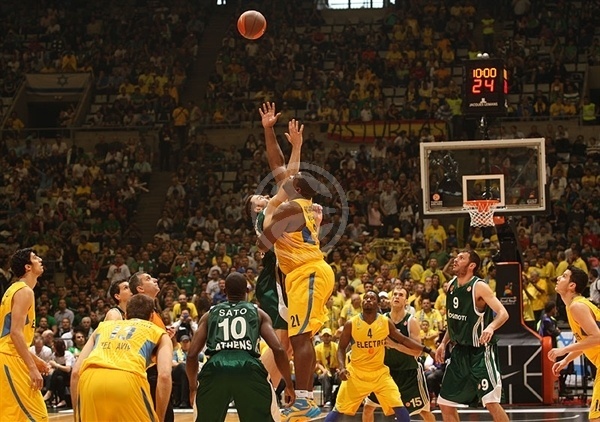 Batiste came in and used a pick-and-roll with Calathes to get to the basket for his first score. Diamantidis red a Pargo pass perfectly and intercepted it for an easy layup. Then Batiste threw down a monster slam and the free throw that came with it to put the Greens up 13-18. 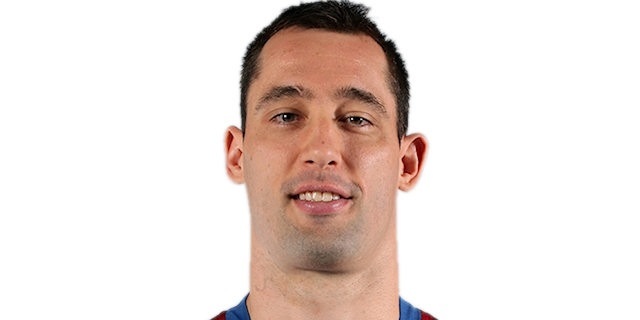 Maccabi’s backup center, Richard Hendrix, pushed over Stratos Perperoglou on offense and also went out with 2 fouls, leaving head coach David Blatt to try Milan Macvan at center. Eidson scored a nice turnaround inside, but Batiste answered quickly and Diamantidis brought the Panathinaikos fans to their feet with a reverse layup, which, after Fotsis blocked Macvan inside, made it 15-22 after 10 minutes. Eidson nailed a triple off a steal early in the second quarter, but Maccabi’s shooting woes inside kept the Israeli powerhouse from getting closer. Diamantidis came back with a clutch triple eliciting a roar from the Panathinaikos faithful. Eidson dished to Macvan inside and then he sank a jumper to narrow the gap to 22-25. 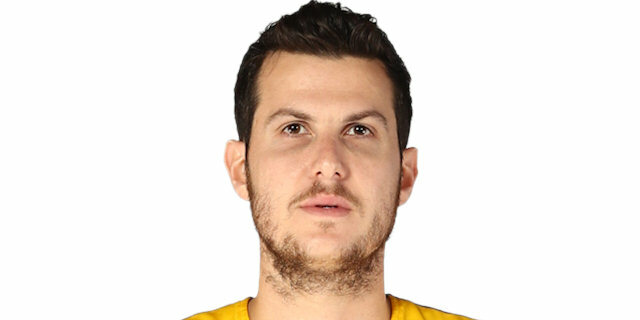 Nicholas took control on a broken play and went into the heart of the Maccabi defense for a layup, but a red-hot Eidson countered with a tough shot on the shot-clock buzzer. 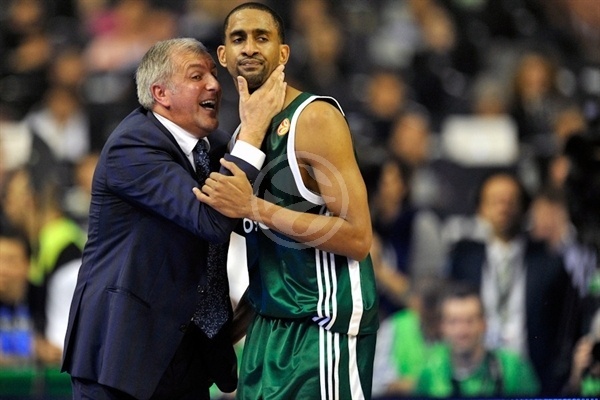 During a TV timeout, Panathinaikos head coach Zeljko Obradovic went to fresh legs by subbing four players. Calathes immediately fed Maric inside. Blu cut the gap to 2 with a three from the corner. 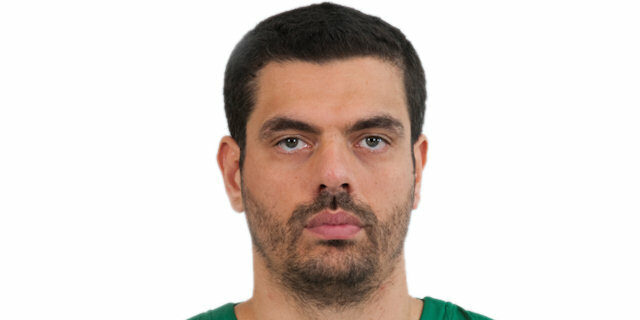 Stratos Perperoglou ended a lengthy second-chance Panathinaikos possession with a jumper. After the next timeout, Maccabi struck from downtown through Blu to cut the deficit to a single point. Sato came right back with a long jumper. 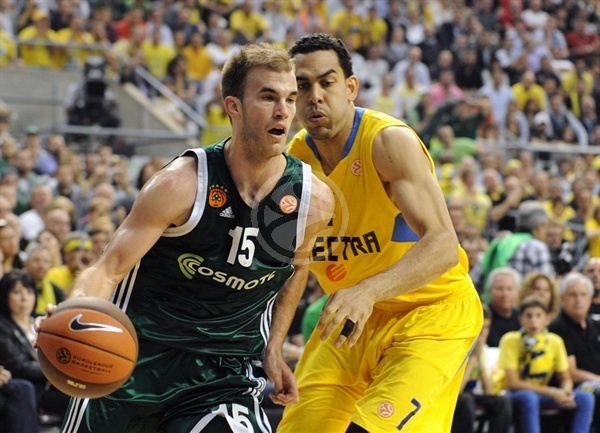 Sato stopped Eidson at the rim to help Panathinaikos keep a 30-33 lead at the half. 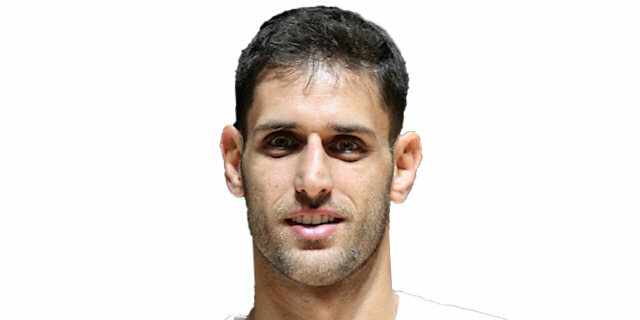 Nicholas fed Batiste inside to keep Panathinaikos up at the start of the second half, but Pargo drove the lane for an impressive spin move and finish that wowed everyone in Barcelona. Pargo looked to take charge and got to the line, where he closed the gap to 34-35. 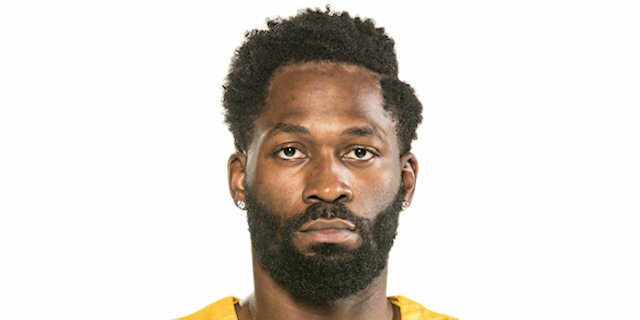 Schortsanitis’s first points of the night gave Maccabi its first lead since the first quarter. Nicholas fired back with a jumper as the lead switched hands. Eidson ran into Batiste and looked like he had run into a brick wall as he went down. Sato drilled back-to-back threes at the other end as Panathinaikos jumped to a 36-43 lead midway through the third quarter. Blu took Sato on and forced a layup-plus-foul to pick his team up. Nicholas had a three from the wing bounce up and in as the Green fans kept singing. Macvan and Batiste each got to the line and made 1. Batiste climbed up to reject Hendrix and Calathes soon raised the Panathinaikos lead to 9 with agive-nad-go with Batiste off the inbounds play. A Fotsis drive and slam put the Greens up 40-51 and Maccabi in panic mode. After a timeout, A triple by Blu gave the Maccabi fans hope, but Sato answered the same way. Eidson looked to beat the buzzer with a deep three, but it was ruled to be after the buzzer and Maccabi was faced with a 43-54 deficit to climb entering the fourth quarter. 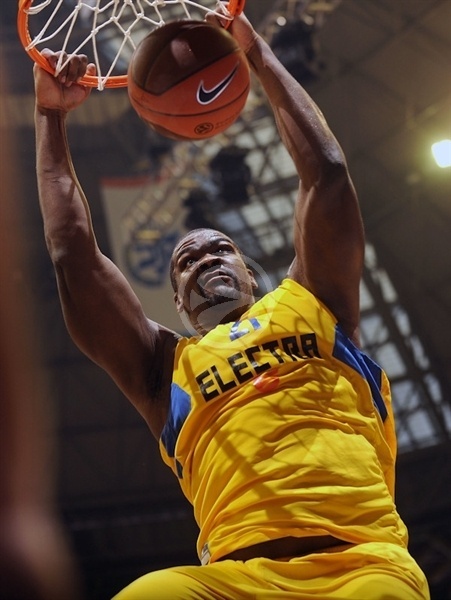 An emphatic Schortsanitis slam was a good sign for Maccabi, but he followed that with his fourth foul. Pargo got to the hoop again only to see Nicholas come through from downtown for the Greens. 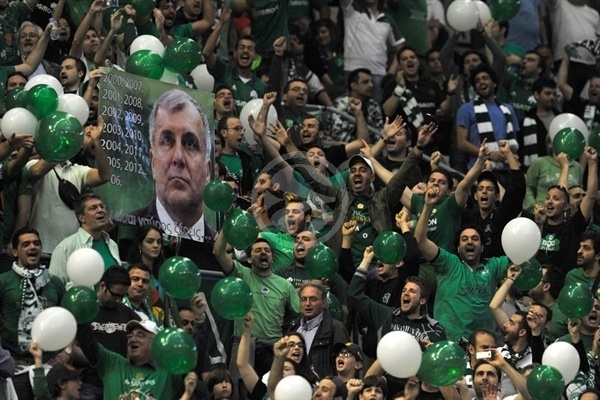 Another Nicholas score made it 47-59 as the Panathinaikos fans looked as confident as ever. 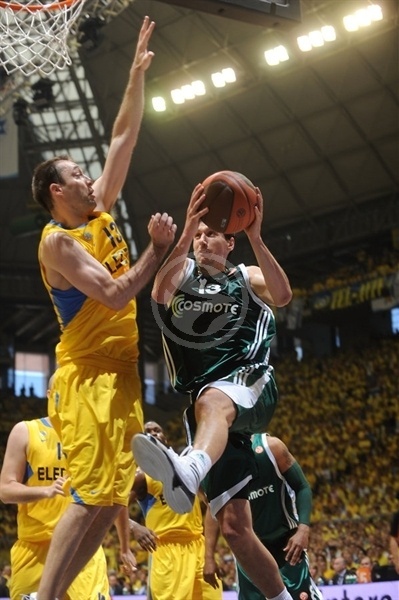 After a break in play, Diamantidis made it a 14-point gap from the line. Lior Eliyahu and Pnini scored to keep Maccabi somewhat in the picture. Another powerful throwdown by Batiste looked to lock up the win. Pargo and Eliyahu with a basket-plus-foul kept Panathinaikos from celebrating early, closing to 56-63 with four-and-a-half minutes left. Batiste, after missing 2 free throws, saved the ball and then scored down low. And Nicholas went for the dagger with a pull-up jumper that made it 56-67 with 3:19 on the clock. Eliyahu missed a makeable layup and Eidson made just 1 from the line as Maccabi’s chances continued fading. 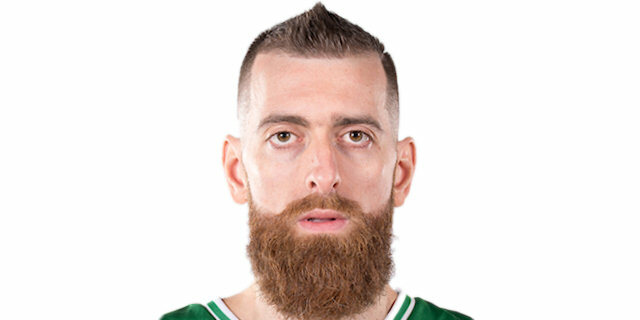 Maccabi and its fans kept believing and caused Panathinaikos to worry when an Eliyahu tip-in with 1:20 remaining made it 64-69. Diamantidis made sure to ice the game with a pass inside to Batiste for a crucial basket and a steal and free throws with 55 seconds to go, signaling that it was time to start the celebrations. 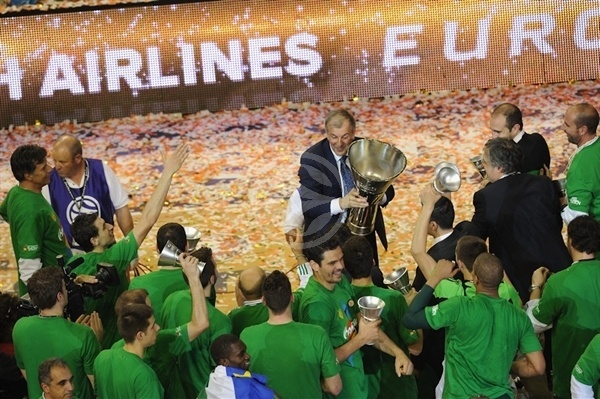 "Congratulations to coach Obradovic and his staff and their team. They were the justifiable winners today in this final. For us I can say only that basketball is not Hollywood and not every story has a happy ending. But it doesn’t make the story bad. 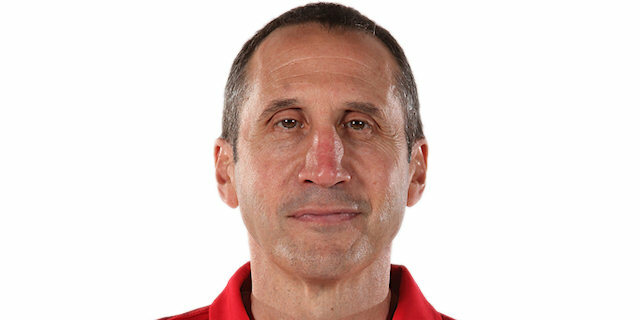 No one gave us a chance in the Final Four let along to win in the playoff after the Top 16. We just did great things all season. We put a team together that played hard, wanted to win, had fun. Even if in the end if we don’t win, the story here was very good for us." "They were tough with [Schortsanitis]. He got into foul trouble early and that hurt him and hurt us. We trailed and when you chase, it’s tougher to use Sofo because he’s not a player built for situations when you are down 8 or 10. So we used him less." 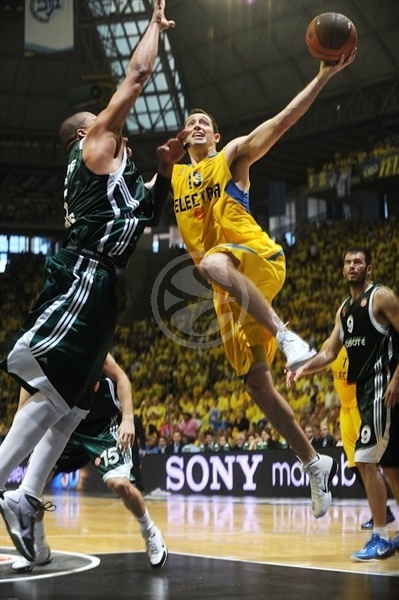 "Diamantidis was the MVP of the Euroleague and he sure played like it today. He’s one of the great European players, maybe of all time because he impacts the game in so many areas and he does it seemingly the right way all the time. He has clam in the face of battle that allows him to see the game more slowly than the rest and to make better decisions than the rest. He the great player that he is." "I am very happy that we are the champions of Europe again. I want to congratulate my players because they have worked very hard all season. I told them before we played in Valencia that we could win it all and they worked very hard in the gym, so they deserve it. I also want to thank all the fans who supported us here, and also Maccabi for competing and having some great fans as well. This final was a perfect example of what basketball should be all about. I want to take this opportunity to say that I received a message before the game from my old assistant in Joventut Badalona, Jose Maria Izquierdo. I had left two tickets for him to attend the Final, and he wanted to come, but was unable to because of the death of his father. I want to dedicate this win to him because he is a great friend and a great man. We had a bad first half, where we didn’t hit open shots and played poorly, but we improved in the second half and controlled the game until the last stretch, when we made some stupid turnovers and allowed Maccabi to think that they could come back. At the end, I think we deserved to win, because we were excellent in clutch moments. You only live once, I am very happy everyday for coaching my players. I love this sport and if everything remains this way I will try to keep doing it for a long time. We all work and try to reach our goals. 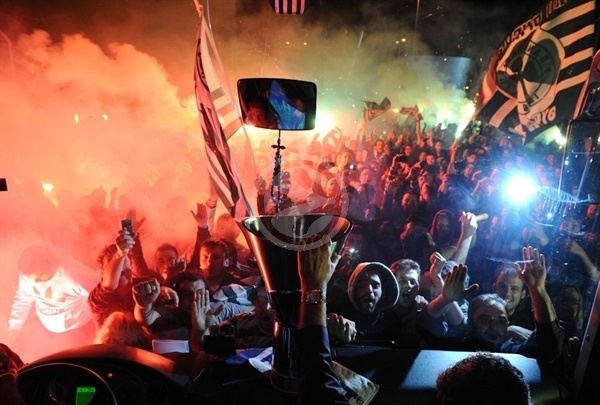 Now we are going back to Athens and we are going to celebrate. But we have to start thinking about our next game against Olympiacos and forget about everything else. This win is wonderful, but we have to look towards the future. There is no other secret to winning than coaching these great players. They know how to play together everyday for Panathinaikos, and that’s the key. We hope something like this can be repeated in the future. We have also made mistakes and we acknowledge them, which is good, because that way we can improve. Eliminating Barcelona was an important step for us, because everybody looks at you differently after that, and because we played well. We got credit for that and self-confidence, so we thought we had many possibilities to win it all. I don’t’ think of winning titles as a personal feat. In this case, it’s important for Panathinaikos. I am very happy for the fact that I have been 12 years with the same club, with the same family that puts money every year in the team to compete in Europe. This team is very good, and maybe we will try to find new young players, but I believe everybody should be back. Continuity is important in order to know what it means to play in Panathinaikos. 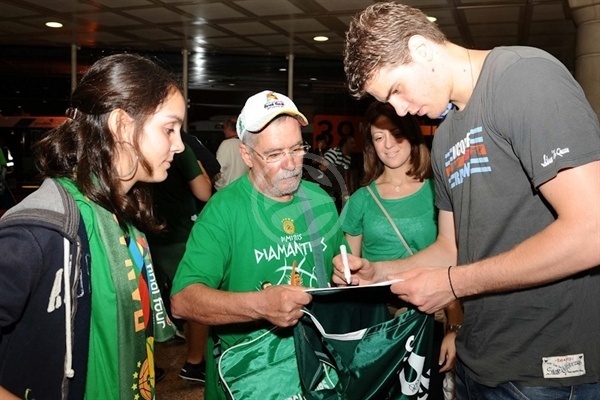 Diamantidis is over here and I am sure he remembers the game we played in Valencia, when everybody talked about us like a good team but with no chance to play in the Final Four. What I said to them is that this was supposed to serve as extra motivation for us. People recognize stars, but my players were ready to work very hard, and I believe that is why we are champions of the Euroleague. The Final Four is a different competition: you try to fight off the pressure but it’s impossible, like we saw today, so we just tried to focus on playing the same way we always play, and we were able to do that. 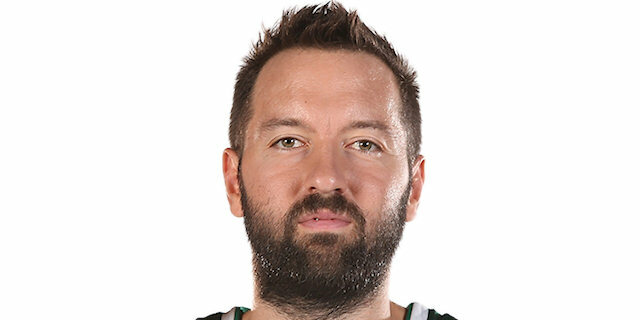 I would never go to the NBA, because I am very happy here in Panathinaikos and all that I need in my life is here in Europe." "The better team today won, and sadly it wasn't us. We're very proud of each other and we all came a long way. We gave everything but sometimes it's not enough. I want to thank our wonderful fans for their great support. It was my first Final Four and surely I hope not the last one, but I certainly won't forget this experience. Hopefully next time we'll get it done." "They were better today. We came as close as possible, but couldn't reach the top. They controlled the game, and it's a real, real shame. For sure we weren't helpless. We fought them for 40 minutes but everybody saw what a great team they are. Every time we came back they knew how to take off again. They have so much experience. The atmosphere was amazing, and I want to say thank you to both groups of fans who made a huge job today. We had an amazing season." "We had a golden opportunity and missed it, so obviously we're disappointed. I believe that if Doron Perkins was with us we would have beaten them, but things happened and he wasn't here with us on the court, and it was too much for us today. I felt the same way today as the whole season and don't think I had to prove to anyone I can show up for big games. We did some good things, but missed on some others and they are a really good team to take advantage of that." "We didn't surprise ourselves at all by making it this far, so not winning the trophy is disappointing. We wanted to win it and believed we could. They packed the paint in the first half and it was difficult to score under the rim. When a team packs the paint it means you have open shots on the arc, so that's why we played like that in the first half. Our fans were amazing and pushed us for 40 minutes, and we certainly were there and had the opportunity. We'll focus from now on the Israeli league and try to finish this season in good style. We're a team, and every time someone else needs to step up or cover for the other that's what we try to do, today as well, but Panathinaikos is a really good team with lots of experience." "They have a lot of good players and we were very well prepared for them, but there were some things we just couldn't handle. When you play against a player who wins the MVP of the season, defensive player of the season and MVP of the Final Four, it's tough to match up with him. Their pick-and-roll gave us a lot of problems, and we couldn't find the answer for that. It's a shame because we came so close. We held such a great team to 78 points so it means we did a good job on defense, but missed a few inches on the other end." "I am really happy. We did a very good job all season and are very happy with the championship right now. We played better the whole game and deserve to be champions." 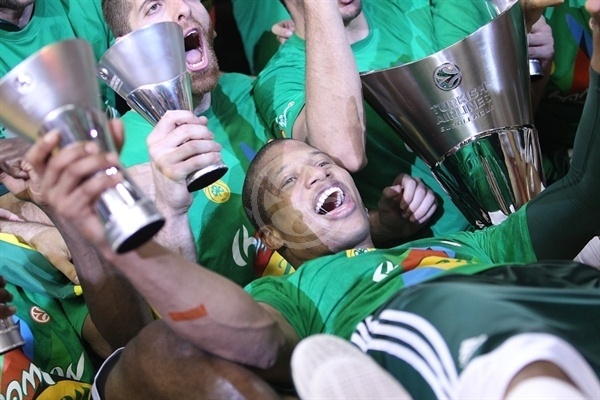 "I love the feeling of winning the Euroleague title. This feeling never gets old! This is my second time and for some of the guys on the team is the first time. It is really special -- you just have to take a look at the atmosphere. It is great! This team has been mentally tough all year, playing for 40 minutes every time. We did it again tonight. We had some tough moments, but played tough all 40 minutes." "I feel very happy. We did a great job the whole year and are happy to be the champions right now. We are very happy and very pleased as a team, players, coaches, fans... everyone. We played better the whole game and deserved to win the title." "This is amazing, it feels great. This is the first time that I have ever won anything, so it is great that my first title is the Euroleague. The players that were out there in the second half played amazingly. They gave it all, led us to win the game and I want to thank them for that. 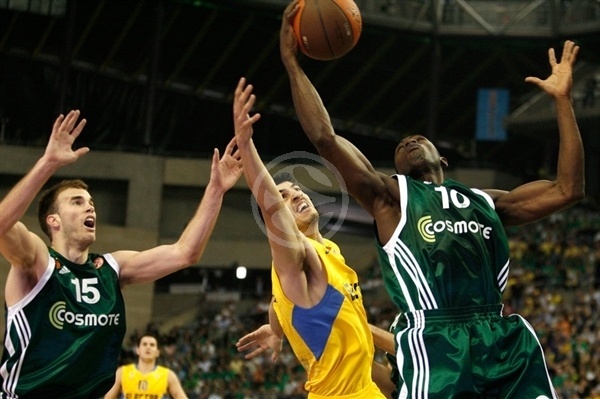 Diamantidis and Batiste were exceptional." "This is my first time in the Final Four and winning the title in my first time around is something amazing. It is the best thing that can happen to a player. I feel like a big dream has been accomplished, so I am very happy. In the end, experience was the key to the game -- everyone could see it. We have many, many experienced players and of course, our coaches know everything about this. Congratulations to them and to the entire team." "I’m very excited and I can’t say in enough words how much it means to us and how all of us deserved it and how hard we worked. 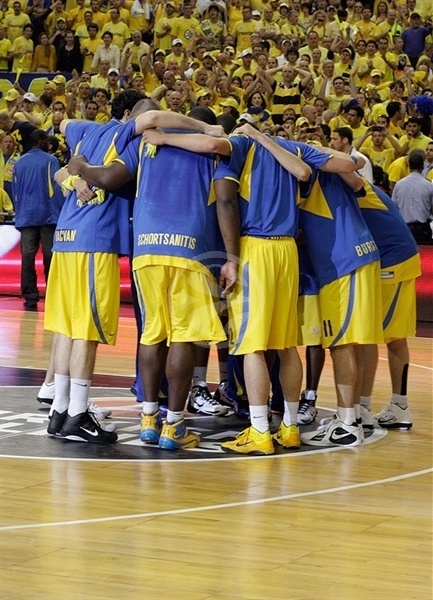 Maccabi is a great team. They made it all the way to the Finals. They have very good fans and are very well coached. We had to bring our A game to beat them and we definitely did. Our fans have been with us all year and you just have to look at how many people came to realize they are the best. It’s a blessing to have these kinds of fans and these kinds of teammates. 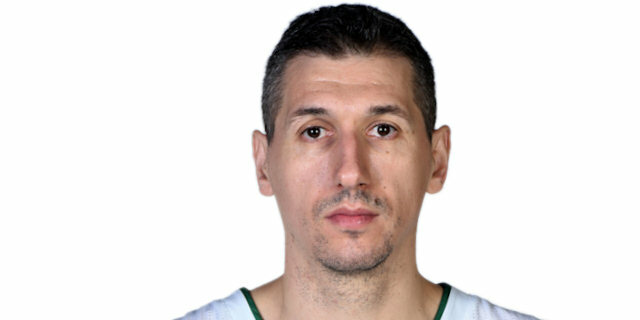 Dimitris (Diamantidis) has led us all the way, all year. He does everything for us, he’s our captain and I’m just happy for him and all the older guys, as well as for my first championship." "This is a great feeling. It’s my first Euroleague title. I can’t explain it. I’m still very excited. It was a very tough game against a tough opponent, but we fought to the end and were able to come out on top in a big Finals game. I started a bit slow, and I felt I was hesitating little bit. Coach told me to just play my game so I started shooting the ball and when I started making my shots, I just kept shooting. It’s a team win, a team effort where defense was the key. We took care of the ball and, even though we did not play well in the final 5 minutes, we still put up a fight and took care of business. 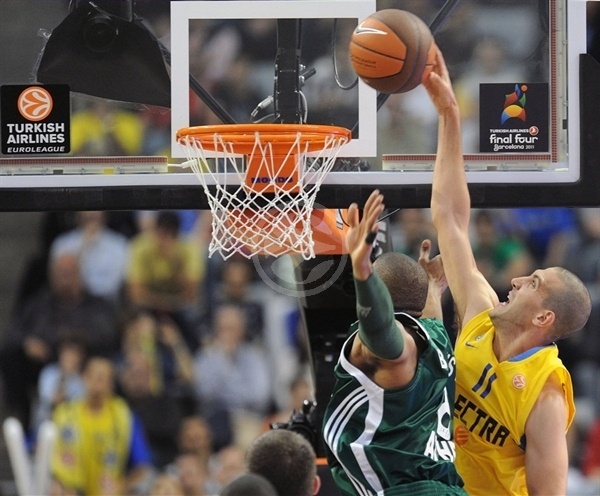 Dimitris (Diamantidis) is unbelievable. On the court and off the court. He does everything for us, and that is why he is the MVP." "We made it to the Final Four and we took advantage of it. I think this is the most special title right here because we fought so hard for it. I believe defense was the key to this win and attacking early on the pick-and-roll against Sofo (Schortsanidis), where we knew they had problems. At the end, they had a full-court press on, and we got a little discouraged, but we pulled through and we accomplished our goal, so I’m happy. We knew there were holes in their defense, man or zone. We wanted to swing the ball and make the defense move, penetrate and make guys help, then pass out, penetrate again… And once we did that we pretty much got everything we wanted. It was just a matter of making or missing shots, and we made most of them. We really had big-time experience, especially in tough situations, and we buckled down, made free throws and that’s why we are where we are right now: standing as champions. Now we are going to party, live it up for a minute, but we still have some games to take care of back in Greece. We will definitely celebrate for a few days, but after that we have to be professional and focused again." 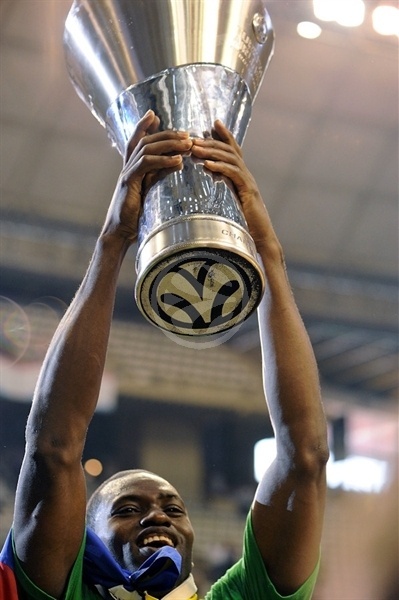 "It is amazing to win again the Euroleague title, there are no words to describe this feeling. I am very happy for our fans, who come to support us everywhere, even in the bad moments. Like last season, when we didn't reach the Final Four, they kept supporting us. I want to dedicate this title to them. Once again, we played great defense and that's what decides every final. 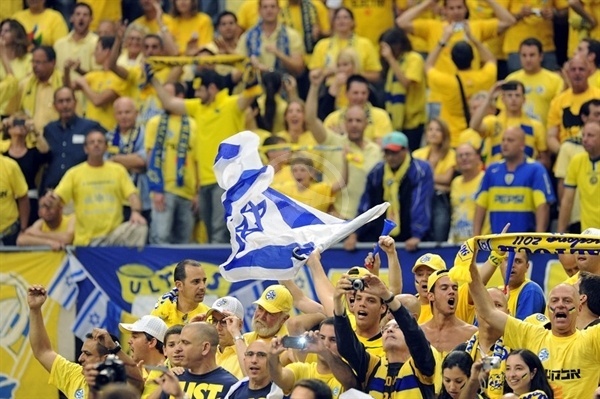 We played good defense and Maccabi could not score as they usually do." 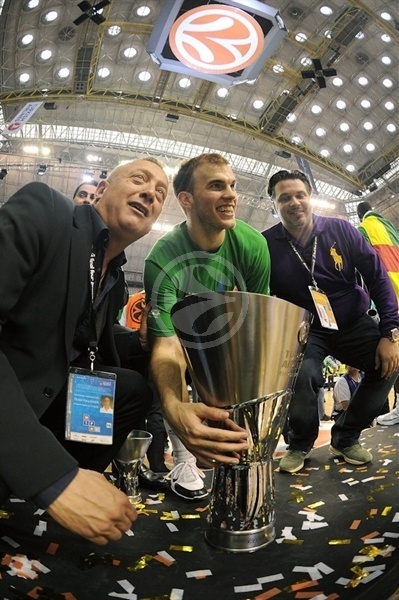 "A lot of good things happened to me this weekend but this is the best one -- winning the Euroleague title. We fought hard and took it! As for the game, I think we played well and all that matters is that we managed to win it in the end. The felling of winning it three times is great. Every trophy you win is great. This is why you practice hard and why you play basketball. That's our life -- maybe we succeed, maybe sometimes not, but we have to give 100% and that's the most important thing." "The last times we have one, things were not good in Greece, so if we have brought some happiness to the people of Greece, we are happy. There’s not much left to say. What’s left coach has said. We have made it. We gave 100% effort and did our best, especially in the second half. "In the first half, we tried to find different solutions, but we were anxious. But coach is right and in the second half we played better. We came in at halftime, we talked to each other, made better choices and this is why we won. 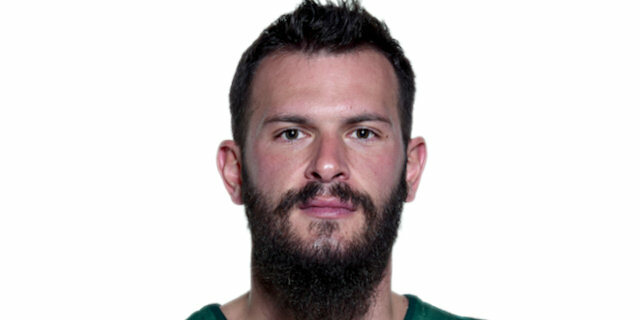 "I am very happy at Panathinaikos and not going to go anywhere. As for the national team, it’s not the time to say the same thing. I am happy. You gotta stop sometime and I will stop. But for the NBA, no. I will stay here at Panathinaikos." "It is a great feeling to win a competition like this -- to be the best team in Europe! We played at a very high level all season long and deserved to win the title. It is not easy to play a game under pressure like this, but we have players like Diamantidis and Batiste who know how to play them. We deserved to win and I am really proud of my team. 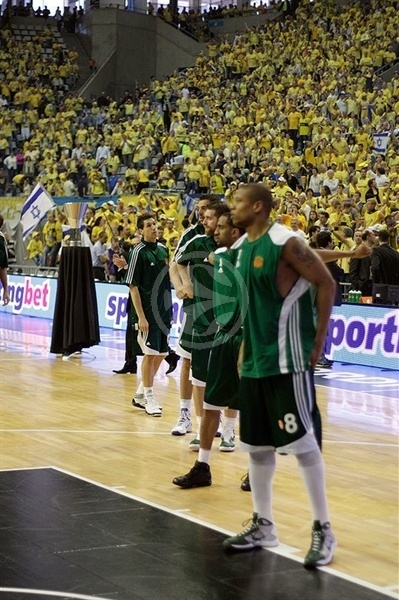 Maccabi is great team but we did a lot of good things on defense. We controlled the game very well despite a couple of turnovers in the final minutes." 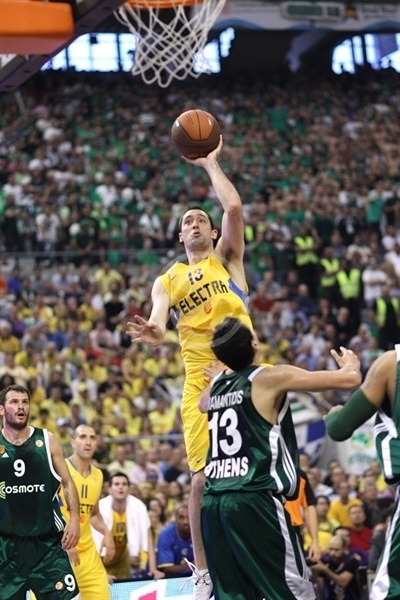 "We knew coming into this game that we had to play like a team if we wanted to beat Maccabi. Being the Euroleague champion is the best feeling in the world. I really can't describe it with words. At least, not right now. I think I won't be able to put this into words until tomorrow. The only thing for certain right now is that I am going to have a lot of fun!" 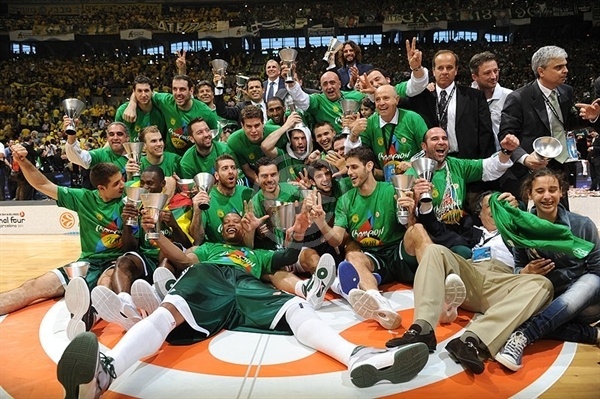 Panathinaikos, 2010-11 Turkish Airlines Euroleague champions!! 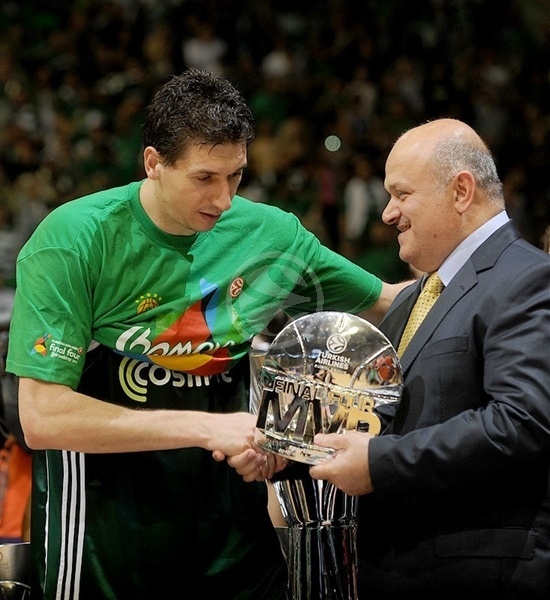 Euroleague Baskeball president and CEO Jordi Bertomeu presents Panathinaikos team captain Dimitris Diamantidis with the Turkish Airlines Euroleague trophy. 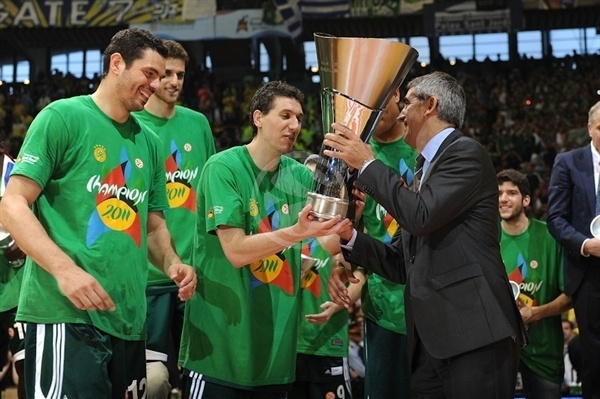 Panathinaikos veterans Dimtiris Diamantidis, Kostas Tsartsaris and Mike Batiste raise the trophy first together. 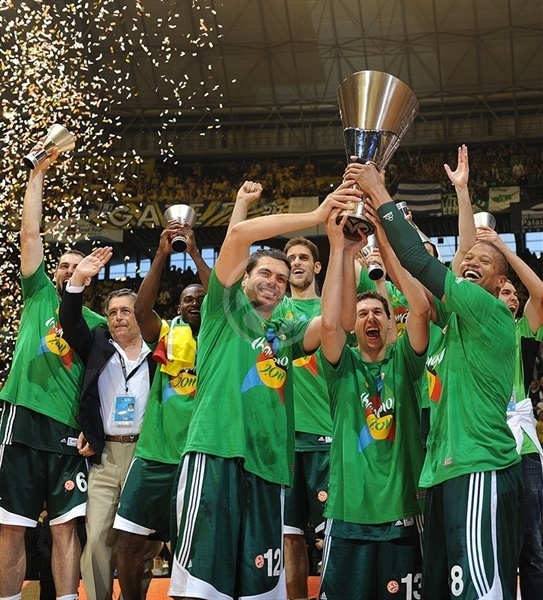 Panathinaikos defeated Maccabi Electra 70-78 on Sunday in Barcelona to take the title. 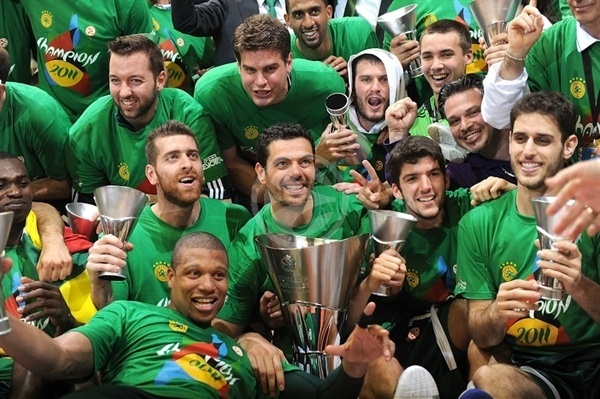 The title was the fifth in 11 years for Panatinaikos, along with 2000, 2002, 2007 and 2009. Dimitris Diamantids receives the Final Four MVP award from Hamdi Topçun, the Chairman of the Board of Turkish Airlines. Diamantidis and Batise in the locker room with their individual trophies. 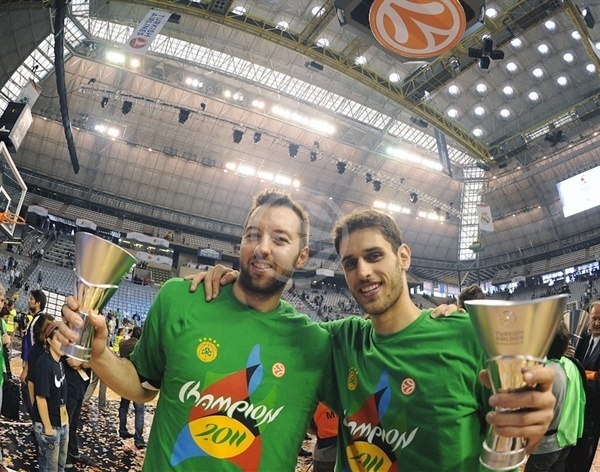 They won their third Euroleague title together. 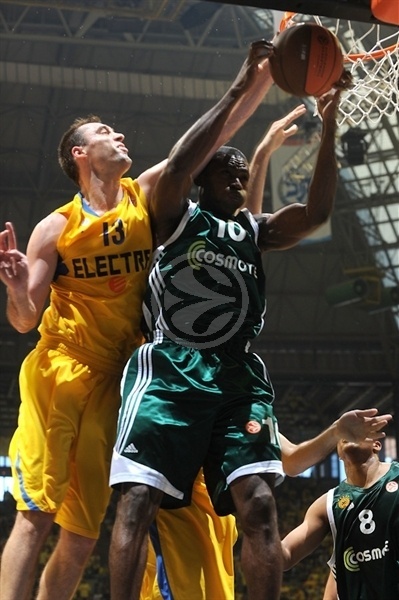 Batiste was the top scorer in the Turkish Airlines Euroleague title game, with 18 points. 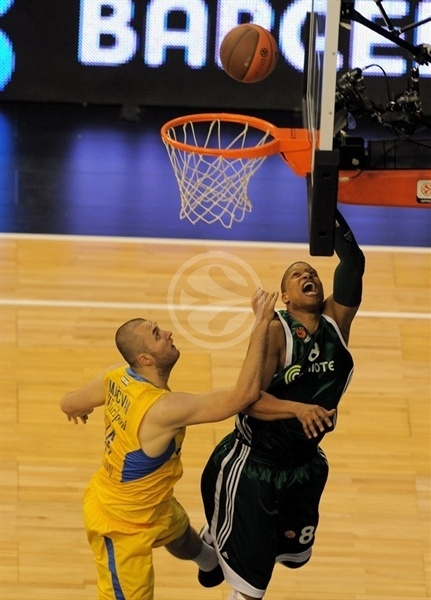 Batiste made 12 out of 15 two-point shots, or 80%, over the two games of the Turkish Airlines Euroleague Final Four. 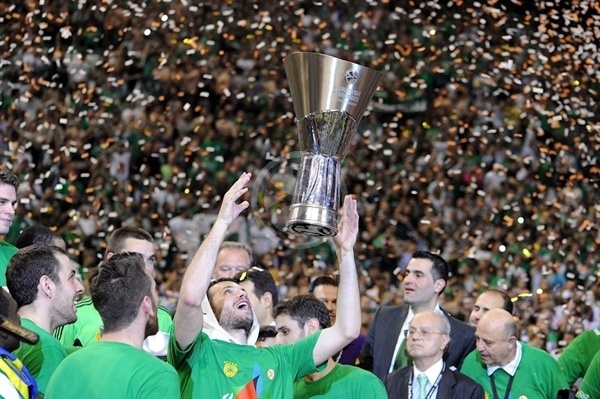 Veteran forward Antonis Fotsis won his third Euroleague title, enough to know how to handle the trophy without committing a turnover. The cup gets a kiss from Drew Nicholas, who joined several teammates in taking their second title in three seasons. 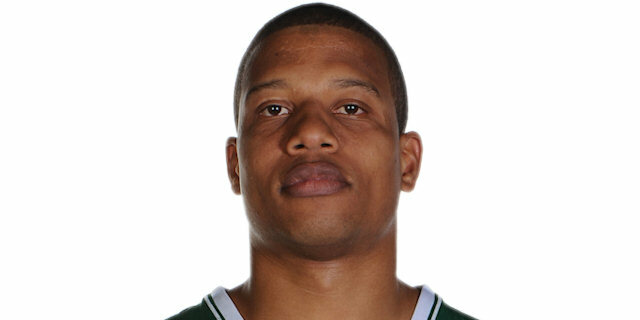 Drew Nicholas pumped in 14 points for Panathinaikos in the title game. Semifinals hero Nick Calathes poses with the first Turkish Airlines Euroleague trophy of his young career. 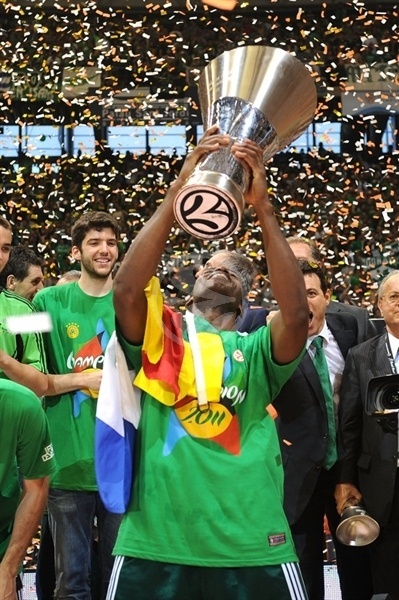 Veteran forward Romain Sato won his first continental title after having helped stop his former team, Montepaschi Siena, in the semifinals. 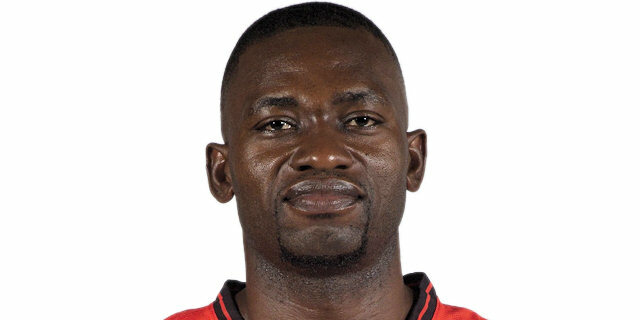 Romain Sato, who is from the Central African Republic, became the fifth player born in Africa and just the second to play for an African national team to become European club champion. 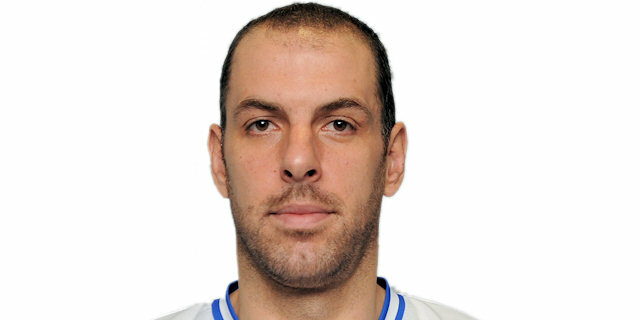 Ian Vougioukas, who joined Panathinaikos before this season, started both Turkish Airlines Euroleague Final Four games on the way to his first trophy. Forward Stratos Perperoglou, who had also won with Panathinaikos in 2009, lifts his second trophy to the delight of the Panathinaikos fans. The t-shirts worn by Vougioukas and Perperoglou for the on-court awards ceremony says it all: champion. 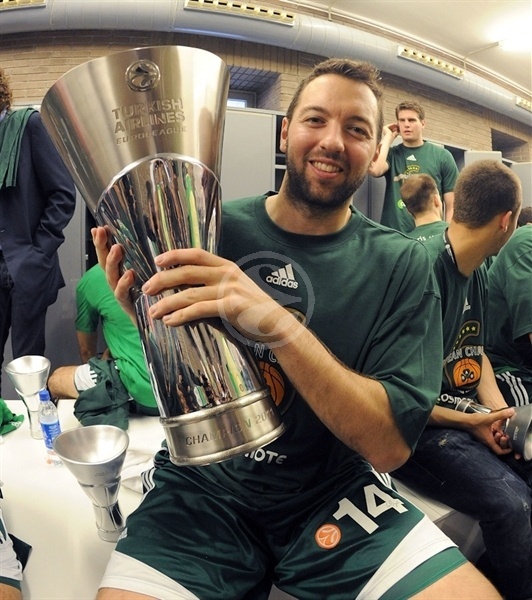 Kostas Kaimakoglou, who played the last 4 seconds of the title game, enjoyed his first Euroleague trophy, too. Head coach Zeljko Obradovic accepts his individual champion's trophy from Jordi Bertomeu, Euroleague Basketball president and CEO. 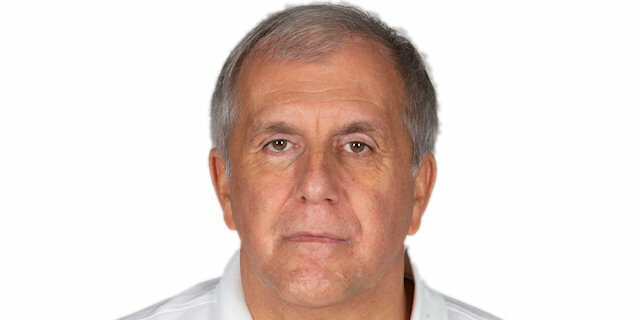 With this victory, Zeljko Obradovic reached his eighth Euroleague title with four different teams, double the total of any other coach ever. 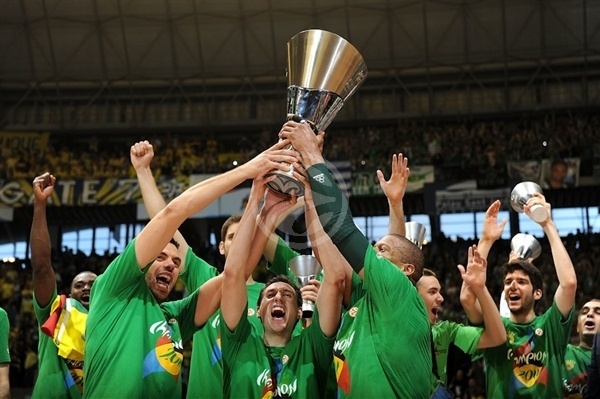 Team delegate Fragiskos Alvertis, who had retired as a player after the 2009 victory, got to lift the new trophy, too. 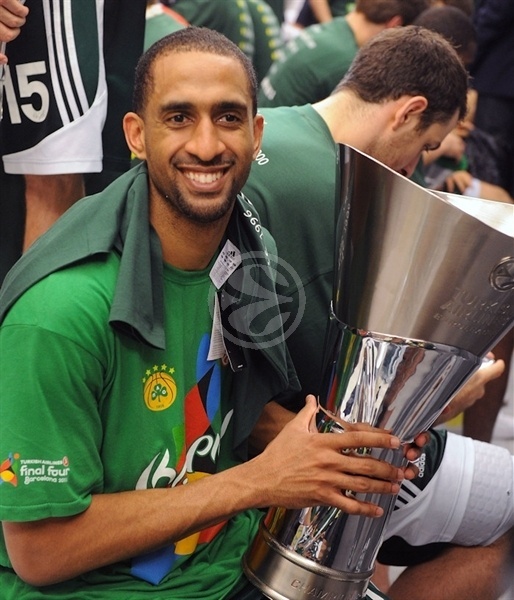 Panathinaikos in new Champ Euroleague 2010-11! 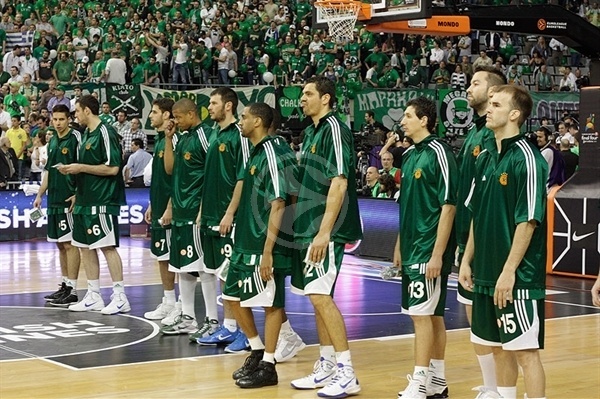 Panathinaikos is ready to go! Maccabi Electra is ready to go! Maccabi Electra takes the floor!